CodeHS courses teach students applicable computer science skills. With a focus on helping students develop problem solving and computational thinking skills, students come away both with a knowledge of professional programming languages and the conceptual understanding needed to learn new languages. Start programming today. You’ll learn the fundamentals of computer science while creating your own animations, graphics, and games for the web. Perfect for absolute beginners learning at school or at home. This course is fully aligned to the Indiana Computer Science I course. Computer Science I challenges students to explore the limits of what computers can accomplish. In this course, students analyze and design solutions to problems using programming skills. The fundamental concepts of programming are explored through the hands-on use of computing devices. Additional topics include algorithms, debugging and verification, documentation, security and privacy, communication and collaboration, and careers. All topics are an intrinsic part of the software development lifecycle. Learn the basics of object-oriented programming with a focus on problem solving and algorithm development. Take this course and prepare to ace the AP Java test. The Computing Ideas course is a first computer science course introducing the basics of programming with Karel the Dog, the basics of designing a web page, and how information and images are represented with computers. Students will learn to code using blocks to drag and drop, but they can switch between blocks and text as desired. Students will create a portfolio on the web of projects they build throughout the course. With a unique focus on creativity, problem solving and project based learning, Computing Ideas gives students the opportunity to explore several important topics of computing using their own ideas and creativity and develop an interest in computer science that will foster further endeavors in the field. As our world becomes increasingly dependent on technology, cybersecurity is a topic of growing importance. It is crucial that companies and individuals take precautions to protect themselves from the growing threat of cyber attacks. This course prepares students with crucial skills to be responsible citizens in a digital future. The Introduction to Cybersecurity is the first online blended K12 cybersecurity course and is designed for students with some exposure to computer science, but there are no specific course prerequisites. Topics included are: foundational cybersecurity topics including digital citizenship and cyber hygiene, the basics of cryptography, software security, networking fundamentals, and basic system administration. Preview demo of the CodeHS Web Design course! This is a project-based course that teaches students how to build their own web pages. Students will learn the languages HTML and CSS, and will create their own live homepages to serve as portfolios of their creations. Students will finish this course with tangible, professional, mobile responsive websites. Learn the basics of SQL. How to structure information, write queries, and analyze data. This course will help you review for the AP Computer Science Exam. It includes a full practice AP Test as well as other practice quizzes and resources. Learn the basics of object-oriented programming with a focus on problem solving and algorithm development. This course is NOT designed to prepare students for the AP Java exam. This is the quarter long Karel course as an introduction to computer science and programming with blocks. This is the quarter long Karel course as an introduction to computer science and programming with text. Este es el curso de Karel como una introducción a la informática y la programación. This course contains hundreds of AP style exam questions to help your students prepare for the AP Computer Science Principles exam in May. The World of Computing course is a first computer science course introducing the basics of programming with Karel the Dog, and allowing students to explore what a computer is and how technology has affected their lives. Students will learn to code using blocks to drag and drop, but they can switch between blocks and text as desired. With a unique focus on creativity, problem solving and project based learning, World of Computing gives students the opportunity to explore several important topics of computing using their own ideas and creativity and develop an interest in computer science that will foster further endeavors in the field. Creative Computing is a first computer science course introducing the basics of programming with Karel the Dog, the basics of designing a web page, and how information and images are represented with computers. Students will learn to code using blocks to drag and drop, but they can switch between blocks and text as desired. With a unique focus on creativity, problem solving and project based learning, Creative Computing gives students the opportunity to explore several important topics of computing using their own ideas and creativity and develop an interest in computer science that will foster further endeavors in the field. Learn the basics of the Java programming language. This hour will cover printing, variables, types, and getting information from users. Write a program that take in and stores data from a user and returns a unique response! Mobile applications are becoming increasingly important to our consumption of media, news, social interaction, and learning. In this course, students will learn how to create mobile apps using React Native, a popular platform-agnostic framework. As an online blended high school course, students will design and build applications to run on their own smartphones and will use the latest tools and technologies available for mobile app development. Students will complete a large end-of-course project where they will practice project development skills to create an app to solve a specific problem. Students will explore how mass and speed affect elastic collisions by using conservation of momentum and conservation of kinetic energy equations to verify final speed values as calculated by a simulation. Students are introduced to Tracy the Turtle and learn how to code different mathematical models in Python! No coding experience is necessary, but students should have completed Algebra I or higher. This Hour of Code looks at how transactions works on the Bitcoin ledger and and investigates the overall performance of the Bitcoin blockchain. This Hour of Code is an introduction to cryptography, hashing and blockchain technology, which is the foundation of Bitcoin. Mobile applications are becoming increasingly important to our consumption of media, news, social interaction, and learning. In this course, students will learn how to create mobile apps using React Native, a popular platform-agnostic framework. As an online blended high school course, students will design and build applications to run on their own smartphones and will use the latest tools and technologies available for mobile app development. This course is designed for a semester-long session. Students will use Turtle Graphics in Python to create their own Punnett Square generator. This course is designed for students who have taken or are taking a biology course. The approximate length of this course is 2-4 hours. Students learn coding as it relates to music, art and sports. Programming With Karel: Module one is programming with Karel. Karel is a dog that only knows how to move, turn left, and place tennis balls in his world. You can give Karel these commands to instruct him to do certain things. We use Karel to show you what it means to program, and allow you to focus on problem solving. Karel Challenges: In this module you'll take all the foundational concepts from Karel to solve some programming challenges. Functions and Parameters: Learn to write reusable code with functions and parameters. Animation and Games: Now, your graphics will come to life. You will learn how to make objects move around the screen. You will also learn how to let the user interact with your program with the mouse. At the end of this section, you will program your very own video game. Cybersecurity: This module includes topics on Internet etiquette and how to stay safe on the world wide web. We will also look at the potential effects of our digital footprints, how to protect information from online risks, and the implications of cyberbullying. Finally, the module includes how to find and cite quality resources online. Control Structures Challenges: In this module you'll take all the foundational concepts from the Control Structures unit to solve some programming challenges. Functions Challenges: Use what you have learned in the Functions unit to solve challenges. Animation Challenges: In this module you'll take all the foundational concepts from the Animations unit to solve some programming challenges. Final Project: In this module you'll take all the skills you've learned throughout the course to create a final program with a partner! Final Exam: Prove the knowledge you've gained throughout this course in a culminating exam. Welcome: Welcome to Intro to CS in Python! Check out our introductory video to get a sense of what this course is about, and reflect on what you hope to get out of it. Introduction to Programming with Turtle Graphics: Learn Python commands, functions, and control structures by drawing shapes on your screen and solving puzzles with Turtle Graphics! Basic Python and Console Interaction: Learn the basics of programming by writing programs that you can interact with using your keyboard! Conditionals: Teach your program to make decisions based on the information it receives. Looping: Learn how to write more efficient code by using control structures as shortcuts. Functions and Exceptions: Learn how to decompose your program into smaller pieces that work together to solve a problem! Strings: Learn more sophisticated strategies for manipulating text in your programs - slicing, concatenating, and formatting. Creating and Altering Data Structures: Learn how tuples and lists are formed and the various methods that can alter them. Extending Data Structures: Build more complex programs that make use of grids and dictionaries. Project: Hangman: Use the skills you’ve learned in the first four modules to build the game Hangman. Web Development: In this unit, students will go through a high level introduction to HTML, CSS, and the processes involved in viewing web pages on the internet. Students will create several simple web pages using the CodeHS online editor to gain practice using the various features of HTML and CSS. Introduction to Programming: Karel is a dog that only knows how to move, turn left, and place tennis balls in his world. You can give Karel these commands to instruct him to do certain things. We use Karel to show you what it means to program, and allow you to focus on problem solving. Basic Data Structures: We introduce lists/arrays. These are the essential basic data structures that any program will use. Digital Information: In this unit, students will learn about the various ways we represent information digitally. Topics covered include number systems, encoding data, programmatically creating pixel images, comparing data encodings, compressing and encrypting data. The Internet: This unit explores the structure and design of the internet, and how this design affects the reliability of network communication, the security of data, and personal privacy. Data: In this unit, students will explore using computational tools to store massive amounts of data, manipulate and visualize data, find patterns in data, and pull conclusions from data. Performance Tasks: Students will be given the chance to review course content and practice the skills necessary to complete each performance task. AP Exam Review: This unit gives students a review of the topics covered in the course and provides practice solving AP Exam style multiple choice questions. Final Project: This project allows students to think creatively about the applications of the concepts covered in the course, and create something of personal value. Introduction to Programming in Java with Karel the Dog: Intro to Java with Karel the Dog. Learn the basics of java commands, control structures, and problem solving by solving puzzles with Karel. Basic Java: Learn the basics of the Java programming language. This unit covers printing, variables, types, as well as how to use the basic control structures in the Java language. Methods: Methods are bits of code that perform a specific task. This module teaches you how to define methods in your programs and uses the autograder to test if your methods are working correctly. Data Structures: This method will introduce basic data structures in Java including arrays, ArrayLists, 2 dimensional arrays and HashMaps. Data structures will be used to design larger applications. Algorithms and Recursion: In this module students will be introduced to fundamental searching and sorting algorithms including sequential search, binary search, insertion sort, selection sort, and mergesort. Recursion is also introduced. AP Test Practice: In this module students will get a practice exam in the same format as the AP Computer Science in Java test. Final Project: This is your chance to build your own application using the new skills you've learned! Introduction to Programming with Karel the Dog: Karel is a dog that only knows how to move, turn left, and place tennis balls in his world. You can give Karel these commands to instruct him to do certain things. We use Karel to show you what it means to program, and allow you to focus on problem solving. What is Computing? : This unit addresses the question What is Computing? Students review a history of computing, learn about the various parts that make up modern computers, learn about the impact computing has had on today's world, and learn about the impacts computing could potentially have in the future. Web Design: In this unit, students will go through a high level introduction to HTML, CSS, and the processes involved in viewing web pages on the internet. Students will create several simple web pages using the CodeHS online editor to gain practice using the various features of HTML and CSS. What is Cybersecurity? : This module gives an introduction to cybersecurity. It focuses on why cybersecurity is important, recent threats to cybersecurity, and different careers in the field. Digital Citizenship and Cyber Hygiene: This module includes topics on Internet etiquette and how to stay safe on the world wide web. We will also look at the potential effects of our digital footprints, how to protect information from online risks, and the implications of cyberbullying. Finally, the module includes how to find and cite quality resources online. The ABCs of Cryptography: In this module, we will dive into the history of cryptography systems, the motivation behind using encryption systems, and basic cryptography systems. Additionally, we will explore topics on how to use cryptography, cryptology, and cryptanalysis to decode a message without the use of a key. Finally, we will look into more advanced cryptographic topics like public key cryptography and hash functions. Software Security: In this module, we will learn what happens when running a web application and how to look inside web apps using developer tools, source code, and more. We will learn basic SQL so we can learn about common attacks like SQLi and XSS, and recommend solutions for flawed security systems. Networking Fundamentals: This module explores the structure and design of the internet and networks, and how this design affects the reliability of network communication, the security of data, and personal privacy. We will learn how the Internet connects computers all over the world. Finally, we will explore basic networking protocols, practical networking, and how networks are secured. Getting Started - What is the Web? : Students get a high level introduction to the Internet and how it functions, investigate how the Internet has impacted society over time, and set course goals for themselves. HTML - Structuring Websites: In this unit, students learn about the language behind all websites: HTML. Students learn about several different HTML tags as well as the basic structure of a web page. Students use HTML to develop several of their own creative web pages. CSS - Styling Websites: In this unit, students learn the language CSS and use it to style their web pages. Students learn about the benefits of styling with CSS, and will use CSS to create several styled web pages of their own. Project - Create Your Homepage: Students will build their own website about themselves. This site will be accessible on their own custom domain, and will be continually improved by the student as they continue on in the course. It will serve as a running portfolio of each creative project they create in the course. Advanced HTML and CSS: This unit dives deeper into different things we can do with HTML and CSS. Students practice advanced topics in HTML and CSS, including visibility, image filtering, interaction, and animation, to develop more advanced web sites. Project - Tell a Story: Students will develop an animated and interactive web page that tells a visual story, and add this web page to their personal portfolio website. Bootstrap: This unit introduces students to Bootstrap, an HTML and CSS framework for developing responsive, professional web sites. Students use Bootstrap to develop several professional, mobile responsive websites. Bootstrap Project: In this project, students work in teams to create a professional, responsive website using Bootstrap. Designing User Interfaces: This unit introduces students to the theory and practice of user interface design. Students learn about what makes an engaging and accessible user interface, and will employ an iterative design process including rapid prototyping and user testing to design and develop their own engaging web pages. Hour of SQL: SQL is a programming languages that allows you to make sense of and organize data in databases. Learn the basics of querying by exploring Harry Potter data. SQL Part II: The SQL: Continue learning more topics in SQL. SQL Functions: Learn how to use functions in SQL to get more information from your data. 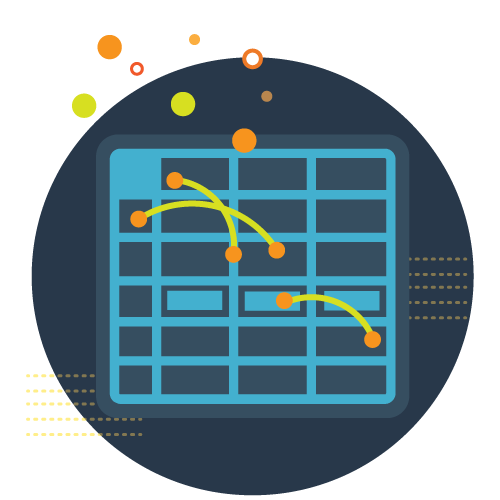 Data Aggregation: In this module, we introduce the HousePoint table which keeps track of who is giving and receiving house points. This allows us to ask all sorts of new questions about our data like who has earned the most points, who has given the most points, who wins the House Cup, and more. Basic Java: This unit covers printing, variables, types, as well as how to use the basic control structures in the Java language. Methods: Methods are bits of code that perform a specific task. This module gives you practice on how to define methods in your programs and uses the autograder to test if your methods are working correctly. Classes and Object Oriented Programming: Practice the basics of Object Oriented Programming in Java including how objects store data and interact with each other, inheritance, and class implementation. Data Structures: Storing data in Java using types such as int, boolean, and double, and one-dimensional and two-dimensional arrays. Searching and Sorting: Practice questions about the standard algorithms for iterating over, searching, and sorting data. Basic Data Structures: We introduce lists/arrays, maps/objects, sets, and grids. These are the essential basic data structures that any program will use. Project: Tic Tac Toe: Did you know that Tic Tac Toe may have been played in Ancient Egypt? Now, you get to make your own game of tic tac toe on the computer! 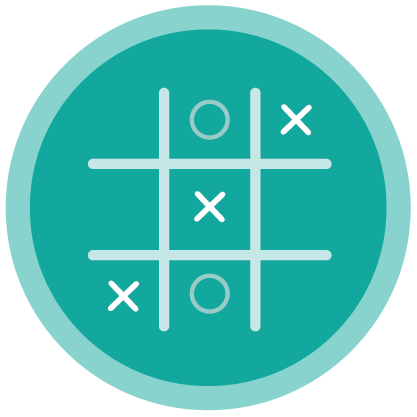 In this module, you will take what you have learned about data structures and make a two player tic tac toe game. Project: Helicopter Game: You now have the tools to make amazing games. This module walks you through the creation of the classic Helicopter game one step at a time. Functions: Learn how to teach Karel new commands by combining existing commands and defining functions. Super Karel and For Loops: Learn about SuperKarel's enhanced ability and how to repeat commands with for loops. If Statements: Students will learn how to test conditions of the Karel world and make decisions on whether to perform actions based on the results of those conditions. While Loops: Learn how to repeat commands while a specific condition is true. Introducción a la Programación: Karel es un perro que sólo sabe mover, girar a la izquierda y colocar pelotas de tenis en su mundo. Le puedes dar a Karel estos ordenes para que haga ciertas cosas. Utilizamos a Karel para demostrar lo que significa programar y para dejarte concentrar en la resolución de problemas. Funciones: Aprende cómo enseñar a Karel nuevos comandos combinando comandos existentes y definiendo funciones. Super Karel y For Loops: Conozca la capacidad mejorada de SuperKarel y cómo repetir comandos con bucles for. If Declaraciones: Los estudiantes aprenderán cómo evaluar las condiciones del mundo de Karel y tomar decisiones sobre si realizar acciones basadas en los resultados de esas condiciones. While Loops: Aprenda cómo repetir comandos mientras una condición específica es verdadera. Estructuras de Control: Practica el uso de For Loops, While Loops y If Statements para escribir programas complejos. Desafíos de Karel: Resuelve algunos desafiantes acertijos con Karel que combinan los conceptos que has aprendido hasta ahora. Proyecto Final: ¡Flexiona tus músculos creativos y escribe un programa creativo con Karel! AP CS Principles Exam Review: This unit contains hundreds of AP style exam questions to help your students prepare for the AP Computer Science Principles exam in May. Reader Question Bank Quizzes: This module contains hundreds of AP-style questions created by the Readers Question Bank. Project: Guessing Game: Create a game where the user needs to guess the secret number! Crazy Ball Game: Make a fun graphical game where the player's goal is to follow a crazy ball that's bouncing all around the screen and click it when it's green and not when it's red. Project: Fun Snake: Create your very own game of Snake where you control the ever elongating snake with the arrow keys to eat as much food and avoid crashing into your own body. Final Project: Your Own Game: Use your knowledge to build a game of your own! Getting Started: This unit introduces students to virtual reality and the A-Frame library. Students will create their first virtual reality world! Advanced Shapes: In this unit, students are introduced to boxes, cones, and cylinders. Students will also learn where to find out more information about the shapes that A-Frame provides. Animation: In this unit, students will learn how to add animations to the objects in their VR worlds. They will learn how to program shapes to move, change color, rotate, and disappear. Interaction: In this unit students will learn how to add interactions so that viewers can interact with objects in virtual reality. 360˚ Images: In this unit, students will learn to work with 360˚ images and videos in their VR worlds. Students will learn the steps to add an image from a 360˚ camera, as well as an image or video sourced online. Students will create their own worlds using 360˚ images, and will gain practice citing their sources when using images captured by others. Next Steps: This unit discusses next steps students can take to further explore virtual reality development with a A-Frame. Topics include viewing your creation in a VR device, using the A-Frame documentation and inspector to keep learning, as well as links to more tutorials and training. Final Project: In this unit, students will combine the skills they've learned to brainstorm and create their own virtual reality final project. Introduction to Programming with Turtle Graphics: Learn the basics of programming by drawing shapes on your screen with Turtle Graphics! Hour of Code: Giving commands to a computer, which is what programming is all about, is just like giving commands to a dog. Learn how to code with Karel the Dog—a fun, accessible, and visual introduction to text or block-based programming that teaches fundamental concepts like commands and functions to beginners. Hour of Code: This activity gives you some examples on how to make your first real mobile apps and how to test them out on your phone. To run apps on a smartphone phone, students will need to download the Expo app. Find more information about Expo at https://expo.io. Hour of Code: Dar órdenes a una computadora, que es lo que la programación se trata, es como dar órdenes a un perro. Aprende a codificar con Karel el perro, una introducción divertida, accesible y visual a la programación que enseña conceptos fundamentales como comandos y funciones a principiantes absolutos. Los estudiantes pueden programar en bloques o texto. Hour of Code: Learn the basics of building and designing a website! Use HTML to add text, pictures, and color to your page. These skills are the foundation for all website creation and is a great activity for students who are interested in the internet and how websites come to life! Turtle Graphics with Tracy the Turtle: Learn the basics of programming by drawing shapes on your screen with Tracy the Turtle! Turtle Graphics (or LOGO) is a beginner friendly way to explore programming concepts and bring creativity into programming in a visual way. Hour of Code: Learn how images are stored and displayed on computers using pixels. Explore how images are encoded as a grid of color values, and make your own digital images using binary and hexadecimal color codes! Hour of Code: Learn the basics of the Java programming language. This hour will cover printing, variables, types, and getting information from users. Write a program that take in and stores data from a user and returns a unique response! Hour of Code: Learn the basics of coding with the Python programming language by writing programs that you can interact with! This hour will cover printing, variables, math, and getting information from users. Write a program that take in and stores data from a user and returns a unique response! Introduction to Mobile Apps: In this module, students will be introduced to the mobile apps course and the React Native framework and it's program structure and syntax. Students will also preview some of the tools and technologies they will use to build and run their apps. Components and the Stylesheet: In this module, students are introduced to components, the backbone of building apps with React Native. They learn about the stylesheet object and how to add custom style attributes to their apps. Touchable Events and State: In this module, students use the TouchableHighlight to create "buttons" that add a layer of functionality. Students also learn about state and how to update the state of their app to create quick, dynamic programs. App Build: Currency Converter App: In this module, students apply their knowledge of components, events, state, and more to build a currency converter app. Students use the Stylesheet to create a user friendly layout that can convert multiple currencies! Advanced Layouts and Images: In this module, students gain a deeper understanding of mobile apps layouts using the Flex layout feature. Students build their own mobile homepages with Flex and add images to their apps to further customize the building experience. Working with Control Structures and Data Sets: In this module, students also use conditionals to allow for more flexible apps as well as adding mapping functions over objects to allow for more scalable and scrollable apps. End of Course App Build: In this project-facing module, students will use everything they have learned in the first semester and design, prototype, and code their own custom app and present it to their class. Tracy's World: Learn about the world Tracy lives in and how to form commands that she will understand! Moving Tracy Efficiently: Build on the commands you’ve learned to instruct Tracy around all parts of her world. Designing and Communicating Solutions: Explore useful ways to break down large problems to write readable and successful programs. Controlling Tracy with Variables: Learn to use variables and user input to control your Tracy commands. Making Decisions: Use if-else statements and while loops to instruct Tracy to make decisions based on conditions. Tracy Challenges: Put together all you’ve learned to create more advanced programs! Coding in Sports: Students learn about event handlers and create more elaborate video games with images, sound, and multiple levels. As a final project, students make a multi-level putting game. Generating Art with Code: Students learn how to code computer-generated fractals, filters, and collages. For a final project, students develop a program that tells a story using images, text, and sound. Digital Citizenship and Cyber Hygiene: This module includes topics on Internet etiquette and how to stay safe on the world wide web. We will also look at the potential effects of our digital footprints, how to protect information from online risks, and the implications of cyberbullying. Information Literacy: This module teaches students how to find and cite quality resources online. Final Project: PSA: In this final project, students will create a public service announcement that educates members of their community about a topic learned throughout this course. Coding in Music: Students will learn how to add chords, notes, and visualizations to their songs. For a final project, students create a full-length song with music visualization. Collision Simulations: Students will explore how mass and speed affect elastic collisions by using conservation of momentum and conservation of kinetic energy equations to verify final speed values as calculated by a simulation. Building Mathematical Models: Students are introduced to Tracy the Turtle and learn how to code different mathematical models in Python! No coding experience is necessary, but students should have completed Algebra I or higher. Cryptocurrency: Explore the Bitcoin Ledger: This Hour of Code looks at how transactions works on the Bitcoin ledger and and investigates the overall performance of the Bitcoin blockchain. Cryptocurrency: Explore Blockchain Technology: This Hour of Code is an introduction to cryptography, hashing and blockchain technology, which is the foundation of Bitcoin. Punnett Square Generator: Explore how we can use a computer to perform calculations by creating your own Punnett Square generator! You will use Turtle Graphics in Python to place images and text on a canvas and then use if/else statements, string indexing, and string methods to print the resulting genotypes from each allele pair. Bouncing Ball Simulation: Have you ever wondered when and where you will use some of those concepts you learned in physics? In this lesson, you'll apply your skills in creating a bouncing ball simulation, complete with gravity and collisions! Students should have some familiarity with physics concepts such as acceleration and velocity.